Victoria's Leader in Hot air balloon flights over Melbourne and the Yarra Valley in Victoria. Includes gift vouchers and flight specials. Discounted Melbourne & Yarra Valley packages - available until 22 April! Available to book online or over the phone on (03) 9429 0277! Why should you fly with us and book directly with us? Here are 3 reasons! A hot air balloon flight over Melbourne city is a sensational and luxurious way to see the iconic views of our city. It’s also amazingly rare - there are very few cities in the world that have hot air balloons flying over them. Flying over the Yarra Valley's beautiful farms and vineyards in a hot air balloon is an amazing and unforgettable way to experience the joys of nature. Serene, peaceful and beautiful, with the odd kangaroo here and there. Our vouchers are fully-transferable, open-dated and valid for 12 months. They will be emailed immediately. Hot air balloon flights are an experience for all your senses, and predominantly sight. The city and countryside from the air is a view like no other. The stunning visual impact of hot air balloons allows us to create potent media campaigns. 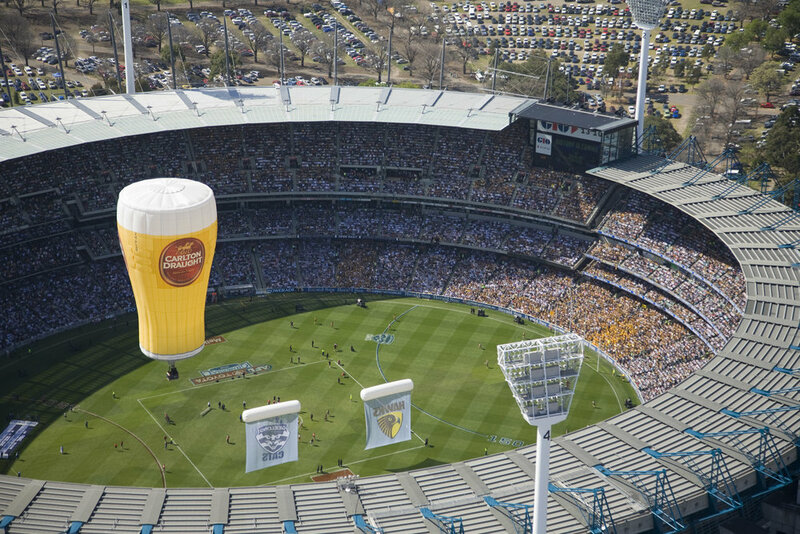 See below for shots of our Carlton Draught Pot special shape that flew through the AFL Grand Final. Our passengers love every aspect of their experience with us. Read their Tripadvisor reviews. Picture This Ballooning is very pleased to announce that we have been awarded the 2018 Certificate of Excellence from TripAdvisor. This adds to our 2013, 2014, 2015, 2016 & 2017 awards. This is the sixth year in a row that we have been ranked in the top-performing 10% of all businesses worldwide on TripAdvisor thanks to consistently high ratings from our passengers. We are honoured to receive these awards as they demonstrate our commitment to delivering a top-quality experience for our passengers and the hard work put in by everyone in our team.